Quad-Core 1024600 2GB Ram Android 8.1 9''USB For VW Receiver Car Stereo. Power Supply: DC 12V (allowance range: 10.8-14.5V). Capacitive or Resistance Screen: Capacitive. Main Menu Status Bar display: Can be changed to Music/Radio/BT-Stereo Player. WiFi: Built-in WiFi Modem, support 802.11b/g/n. Online Communication: WeChat, Twitter, Facebook, Skype, Gmail, Whatsapp etc. Read and edit Office Software: Yes, support Word, Excel, Powerpoint, PDF, TXT. 264, DIVX, XVID, RM, RMVB, MKV H.
30 formats, Playing internet video directly (while downloading). Could play via song list. Other: LRC synchronized display; ID3 search; Search by files; Album Picture; User-defined audio effect. Audio IC: Top Global Cirrus IC, independent audio decoding. Support Maps: IGO, Google Map etc. Support 2D/3D Map Views: Yes. Dual Zone: Yes, navigating while music playing. Online Navi: Yes, support google maps online navigating. A2DP (Bluetooth Stereo Music): Yes, can play stereo music through Bluetooth. Bluetooth Music Control: Yes, play/pause/previous/next. PB-Download: Yes, can download phonebook from mobile to this unit. PB-Search: Yes, can use the first letter to search contact member in PB-Listings. Calling Records: Yes, Dialed Call, Received Call, Missed Call. Setup: Auto Answer, Auto connect, Device name. Built-in Microphone: Yes, on the front panel. FM Tuning Range: 87.5-108MHz. FM Increment: 0.05MHz(EU)/0.1MHz(US). Position: 2 USB Port, can be connected with Media/Camera/ Smartphone. Play MP5 Videos: Yes, can play RMVB Videos up to 1080P. Touch Music Title to play directly: Yes. Built-in Car Recorder App: Yes, just connect a USB Camera to use this function. Support HD CCD Camera: Yes. Play recorded Video directly: Yes. Storing Position: Nand Flash/GPS Card/USB Storage can be changed. DVR is Optional, Not include. DTV-BOX is Optional, Not include. Built-in DAB Player App: Yes. Power Supply to DAB+ Box directly: Yes. Touch Control DAB+ Box on unit: Yes. DAB+BOX is Optional, Not include. TPMS BOX is Optional, Not include. Textbook: Could change font, font color, background color, bookmark, reading E-book while listening music. Photo Viewer: Support JPS, BMP, PNG, GIF etc. Standard wallpapers, support DIY wallpaper from Gallery. APK Installer: Support Android Package installer. Support Torque Pro(OBD2 &Car): Yes, you can connect a Bluetooth OBD2 Scanner Tool to use this function. OBD2 BOX is Optional, Not include. Support Mirror Link function: Yes, Support screen mirroring from iPhone and android smartphone. Yes, TPMS BOX not include. Sound: Key Tone & Volume. Storage: Display Internal Storage/Nand Flash/Connected Device Storage. Apps: Running Apps display/force stop/uninstall. Languages and Input: more than. Languages and choose input method. Date and Time: Setting Date&Time by yourself or choose GPS/network-provided time. GPS: Yes, GPS application options/monitoring/sound mode/mixing ratio. Driving safety: Watching Video, Reversing X-mirror/Volume, Reversing Trajectory/radar Display, Rear view ruler. Rear-View Camera Video In: One. 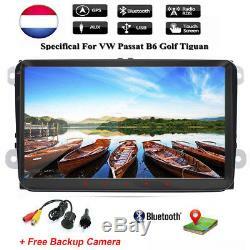 L'item "GPS Autoradio 8 Android 8.0 USB NAVI For VW Golf 5 6 Passat Jetta Skoda Touran" est en vente depuis le mardi 11 décembre 2018. Il est dans la catégorie "Auto, moto pièces, accessoires\Autoradios, Hi-Fi, vidéo, GPS\Multimédia embarqué\Unités principales systèmes stéréo".